We chose this museum for one reason: Gallery One. 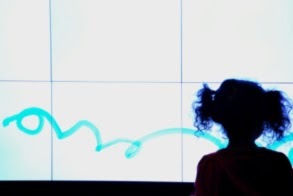 On January 21, 2013, the Cleveland Museum of Art opened Gallery One, a unique, interactive gallery that blends art, technology and interpretation to inspire visitors to explore the museum’s renowned collections. This revolutionary space features the largest multi-touch screen in the United States, which displays images of over 3,500 objects from the museum’s world-renowned permanent collection. This 40-foot Collection Wall allows visitors to shape their own tours of the museum and to discover the full breadth of the collections on view throughout the museum’s galleries. Not since the opening of the Guggenheim Museum Bilbao, in Spain, has a museum set the industry on it’s ear – and this time the architecture is not the main attraction. Technology has taken front stage in one of the world’s most reputable and respected art institutions. The museum could always boast that its collections made it one of the top 20 art museums, but now museum-lovers and professionals from all over the world have trekked to Cleveland to experience art in a whole new way. Congratulations, Cleveland Museum of Art! 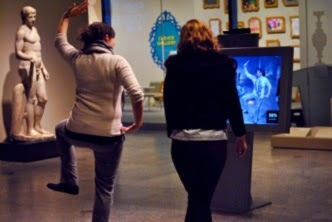 We can’t wait to see what the next century brings in museum technology thanks to your bold step into the 21st Century! The Cleveland Museum of Art is renowned for the quality and breadth of its collection, which includes almost 45,000 objects and spans 6,000 years of achievement in the arts. Currently undergoing an ambitious, multi-phase renovation and expansion project across its campus, the museum is a significant international forum for exhibitions, scholarship, performing arts and art education. One of the top comprehensive art museums in the nation and free of charge to all, the Cleveland Museum of Art is located in the dynamic University Circle neighborhood. The Cleveland Museum of Art is supported by a broad range of individuals, foundations and businesses in Cleveland and Northeast Ohio. The museum is generously funded by Cuyahoga County residents through Cuyahoga Arts and Culture. Additional support comes from the Ohio Arts Council, which helps fund the museum with state tax dollars to encourage economic growth, educational excellence and cultural enrichment for all Ohioans. For more information about the museum, its holdings, programs and events, call 888-CMA-0033 or visit www.ClevelandArt.org. Throughout the space, original works of art and digital interactive experiences engage visitors in new ways, putting curiosity, imagination and creativity at the heart of their museum experience. Innovative user-interface design and cutting-edge hardware developed exclusively for Gallery One break new ground in art museum interpretation, design and technology. Visitors to Gallery One will discover new ways of interpreting the museum’s distinguished collection through a variety of hands-on and technology-based activities. Works of art from the permanent collection on view in the gallery, include masterpieces by Pablo Picasso, Auguste Rodin, Viktor Schreckengost, Giovanni Panini and Chuck Close. Games encourage visitors to see themselves in the collection, matching their faces to works of art or striking the poses of sculptures. In addition, touchscreen interactives and the museum’s new ArtLens iPad application allow visitors to explore how works of art were made, where they came from and why they were produced. At every turn, technology is used to bring visitors back to works of art and to open multiple perspectives on the collection. Comprised of three major areas, Gallery One offers something for visitors of all ages and levels of comfort with art. Studio Play is a bright and colorful space that offers the museum’s youngest visitors and their families a chance to play and learn about art. Highlights of this portion of Gallery One include: Line and Shape, a multi-touch, microtile wall on which visitors can draw lines that are matched to works of art in the collection; a shadow-puppet theater where silhouettes of objects can be used as “actors” in plays; mobile- and sculpture-building stations where visitors can create their own interpretations of modern sculptures by Calder and Lipchitz; and a sorting and matching game featuring works from the permanent collection. This space is designed to encourage visitors of all ages to become active participants in their museum experience. One of the most unique and innovative aspects of Gallery One is the Collection Wall, a 40-foot, interactive, microtile wall featuring works of art from the permanent collection that rotates by theme and type, such as time period, materials and techniques, as well as curated views of the collection. 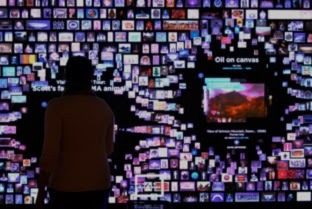 The largest multi-touch screen in the United States, the Collection Wall utilizes innovative technology to allow visitors to browse these works of art on the Wall, facilitating discovery and dialogue with other visitors. The Collection Wall can also serve as an orientation experience, allowing visitors to download existing tours or curate their own tours to take out into the galleries on iPads. The Collection Wall, as well as the other interactive in the gallery, illustrates the museum’s long-term investment in technology to enhance visitor access to factual and interpretative information about the permanent collection. Gallery One is generously supported by the Maltz Family Foundation, which donated $10 million to support the project. Additional support for the project comes from grants and other donations. The museum’s collections are FREE of charge to visit. The museum is accessible to disabled visitors. Ramps and elevators serve the north entrance. Wheelchairs are available at the coat check in the north lobby. Most of the historic 1916 building is accessible, but visitors must enter from the north via the new east wing. The south steps, which are open during the spring and summer, are not wheelchair accessible. Assisted listening devices are available for use in the lecture and recital halls (ask attendant or projectionist). Service animals accompanying disabled individuals are welcome. Specially designed tours for visually impaired and hearing-impaired visitors are offered by prior arrangement. Contact the education department.